BOILING SPRINGS, N.C. — It seemed like another big night for the first-place Winthrop Eagles. Leading 50–31 four minutes into the second half, Winthrop had everything going its way, controlling the tempo and knocking down shots. A 15–0 Gardner-Webb run staggered the Big South’s leader, and the Runnin’ Bulldogs fought back to tie the game with a half-minute remaining. Winthrop got two free throws from Xavier Cooks with 14 seconds to play and a blocked final shot by Duby Okeke, though, giving the visiting Eagles a 72–70 victory in front of 1,781 fans at Paul Porter Arena. Winthrop (16–4, 8–1 Big South) played a dominant first half, nearly limiting a second straight opponent to fewer than 20 points in the opening 20 minutes. Gardner-Webb (11–11, 4–5) connected on just 6-of-28 tries (21.4 percent) in the opening stanza, as a combination of misfortune from the floor and Winthrop’s suffocating defense limited the home side. The defensive energy helped to key the second-half burst, with the Runnin’ Bulldogs forcing six of the Eagles’ 15 total turnovers in a roughly four-minute span. The Runnin’ Bulldogs used those turnovers to get into transition, eventually drawing within a point on several occasions. Forward DJ Laster drained a triple at the 7:19 mark, drawing Gardner-Webb level with Winthrop for the first time on the evening. The Eagles answered much as they did throughout the half, though, as a Rod Perkins trey kept the Runnin’ Bulldogs at arm’s length. Winthrop was unable to separate itself beyond a four-point margin as the game wound down. Gardner-Webb went to the line on two separate occasions inside the three-minute mark with the chance to take its first lead of the evening, but only made one of two tries on each trip. The second visit to the stripe set the stage for a chaotic final minute. An Eagle three-pointer missed the mark, as did a Runnin’ Bulldog dunk attempt on the other end. Cooks then drew a foul on the ensuing possession, then calmly stepped to the line and drained both attempts. 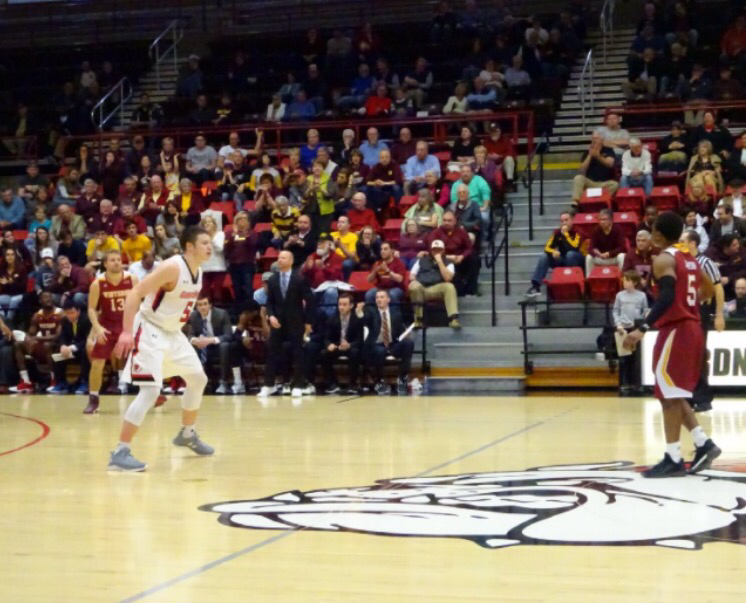 Gardner-Webb called timeout after crossing the center-court line to draw up a final play, and after a Winthrop timeout before play resumed, the Runnin’ Bulldogs’ possession resulted in a loose ball and scramble. A review of the play left 3.2 seconds for the home team’s final attempt, a Nelson try at the tin that Okeke stuffed as the horn sounded. David Efianayi led Gardner-Webb and all scorers with 22 points on 6-of-11 shooting, adding 8-of-9 from the line. Laster finished with 20 points and five boards in 25 minutes off the bench. Point guard Laquincy Rideau finished with 11, tallying six rebounds, three assists and three steals. Neither Rideau nor Nelson played 30 minutes in the contest, as both battled foul trouble. The Runnin’ Bulldogs were as hot in the second half as they were cold in the first, knocking down 18-of-26 tries (69.2 percent) in the stanza. Winthrop connected on 26-of-56 tries (46.4 percent) from the floor in the victory. Cooks paced the Eagles with 19 points and nine rebounds, despite playing just 23 minutes due to foul trouble. Senior guard Keon Johnson contributed 15 of Winthrop’s 32 bench points, as he did not start after missing a practice due to a death in the family. Both teams return to the court Saturday. Winthrop will host High Point, with the game slated to begin at 2:00 (Eastern). Gardner-Webb travels to Charleston Southern, with that contest set to tip at 5:30. WINTHROP (16–4, 8–1 BIG SOUTH): Cooks 8–16 2–2 19, Davenport 1–4 2–2 4, Okeke 4–4 0–3 8, Perkins 2–4 0–0 6, B. Broman 1–2 0–0 3, Johnson 5–15 3–5 15, A. Broman 1–3 4–6 7, Pickett 0–2 0–0 0, Ferguson 1–1 2–2 4, Prescott 3–5 0–0 6. Totals 26–56 13–20 72. GARDNER-WEBB (11–11, 4–5): Miller 2–3 1–2 5, Nelson 4–12 0–0 8, Robateau 0–5 0–0 0, Rideau 4–10 3–5 11, Efianayi 6–11 8–9 22, Jamison 0–0 0–0 0, Turner 1–1 0–0 2, O’Reilly 1–3 0–0 2, Laster 6–9 7–10 20, Niangane 0–0 0–1 0. Totals 24–54 19–27 70. Halftime — Winthrop 37–21. 3-Point Goals — Winthrop 7–20 (Cooks 1–4, Perkins 2–4, B. Broman 1–2, Johnson 2–6, A. Broman 1–3, Pickett 0–1), Gardner-Webb 3–12 (Nelson 0–1, Robateau 0–2, Rideau 0–2, Efianayi 2–4, O’Reilly 0–2, Laster 1–1), Charlotte 4–16 (White 0–3, Davis 3–6, Ajukwa 1–3, Jackson 0–2, Ogbueze 0–2). Fouled Out — None. Rebounds — Gardner-Webb 37 (Nelson 7), Winthrop 32 (Cooks 9). Assists — Winthrop 16 (B. Broman 5), Gardner-Webb 12 (Rideau/Turner 3). Total Fouls — Winthrop 22, Gardner-Webb 19. Technical — None. A — 1781. Points in the Paint — Gardner-Webb 38, Winthrop 28. Points off Turnovers — Gardner-Webb 15, Winthrop 13. Second-Chance Points — Winthrop 11, Gardner-Webb 10. Fast Break Points — Winthrop 8, Gardner-Webb 6. Bench Points — Winthrop 32, Gardner-Webb 24.